Activist Alexei Navalny has called for a voters strike and day of protests on Jan. 28. Russian President Vladimir Putin is officially running for a fourth term in office — but his critics won't stay quiet during his campaign. On Wednesday — the same day Putin filed for re-election — activist Alexei Navalny called for a voters strike and day of protests on Jan. 28. In a blog post, Navalny said he and his supporters "refuse to call Putin's reassignment 'elections.'" 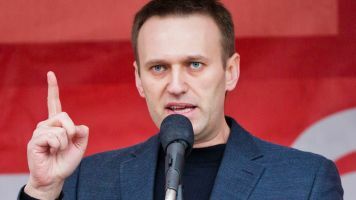 Navalny was originally planning to run against the president, but Russia's electoral commission barred his campaign due to a prior fraud conviction. The Putin critic doesn't really need to run against the president to organize opposition, however. Back in October, Navalny organized a march on Putin's 65th birthday. Thousands of people in 26 cities took part in the protests, and 290 of them were arrested. Because of Putin's strict public assembly laws, Navalny served a 20-day jail term for the event. Next month, he could face the same punishment.